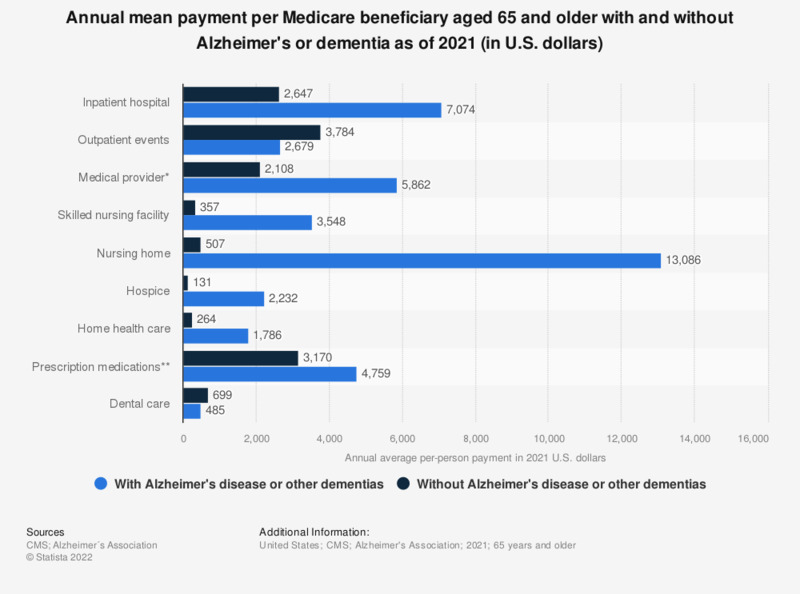 This statistic displays the average annual per-person payments for health care services provided to Medicare beneficiaries aged 65 years and older with and without Alzheimer's Disease or other dementias, as of 2018, in the United States. The average payment per beneficiary without Alzheimer's for hospice services totaled 156 U.S. dollars. This statistic is based on unpublished 2011 Medicare data (in 2018 U.S. dollars). * “Medical provider” includes physician, other medical provider and laboratory services, and medical equipment and supplies. ** Information on payments for prescription drugs is only available for people who were living in the community; that is, not in a nursing home or assisted living facility.